The Detroit chapter of the national Labor Party is joining with MichUHCAN, welfare reform groups, and others to launch a campaign for single payer health care. 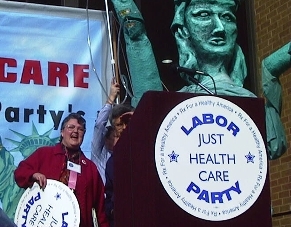 Detroit activity will be part of a national Labor Party campaign called "Just Healthcare." The national campaign will include petition signature-gathering and a national "media visibility day" - with ads in local papers financed through local fundraising. Materials for these projects will be distributed soon. Meanwhile, a local committee of Labor Party and MichUHCAN activists met in mid-February to plan educational work. The committee proposes a training program on health care for Labor Party activists in preparation for educational outreach to unions and community groups. Labor Party leaders are seeking coalition with a variety of groups, nationally and locally. At the same time they've said that partial solutions like patient protection and expanding Medicare could hinder true health care reform. The Labor Party national convention last November passed a resolution saying the organization will not waver from a focus on single payer. In Massachusetts last fall, the Labor Party tested the climate for single payer by putting a non-binding resolution on the ballot in two districts. The resolution for "universal coverage of comprehensive health care services," and elimination of health insurance companies, won by over two to one in the two districts combined. For more information or to get involved in the "Just Healthcare" campaign, contact Al Cholger (248-549-8633).